Meet Brenpa, the founders of Our Mindful Kitchen. “Brenpa” is short for Brett and Penpa, the heart behind this venture. Our Mindful Kitchen is the fruition of a work of love and union, a blending of masculine and feminine energy, a merging of different cultural and racial backgrounds. Penpa Dolma arrived on Earth in a small village on the Tibetan plateau and grew up as a refugee in India. She was educated in a Tibetan boarding school with an emphasis on both Western and Eastern styles of education. The school was founded by the 14th Dalai Lama and his sisters. Since the school was founded to preserve the rich culture, religion and language of Tibet, tenets of Tibetan Buddhism became her principle foundation. Brett Engle, on the other hand, was born in Washington DC, and then grew up mostly in Colorado. His parents were heavily invested in the non-profit world. His mother, Dawn Gifford Engle, co-founded the PeaceJam Foundation and has worked with 13 Nobel Peace Laureates to inspire and create young leaders of peace. On the other hand, his dad, Adam Engle, co-founded The Mind and Life Institute, which facilitates “building a scientific understanding of the mind as a way to help reduce suffering and promote human flourishing. To accomplish this, they foster interdisciplinary dialogue between Western science, philosophy, humanities, and contemplative traditions, supporting the integration of first-person inquiry through meditation and other contemplative practices into traditional scientific methodology.” Brett has taken part in both of these ventures with enthusiasm, and today he emcees the PeaceJam Conference and trains mentors and future emcees along with his yoga teaching profession. We first met in India in 2002 in the small town of Dharamsala, where the Tibetan exile community and the 14th Dalai Lama reside. A common friend set us up on a blind date, and we hit it off instantly when we finally met. At the time, we were both young and did not see a future together with the odds stacked so against us. But some things are meant to happen no matter how much resistance we put up. A few years later, in 2006, we found ourselves single and decided to rekindle the relationship and see if there was depth to it. Brett moved to Delhi, India to live with Penpa and start their new life. Despite being from very different backgrounds, we found common passion in creating a just, sustainable, compassionate planet of collaboration and abundance. 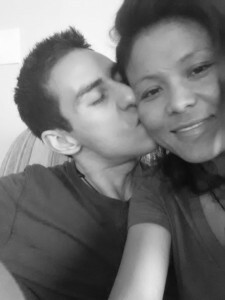 We worked well together, the love was real, and it was a new beginning for both of us. We were angry, passionate and excited. We got engaged in Kathmandu, Nepal in front of Boudhanath Stupa in 2007. 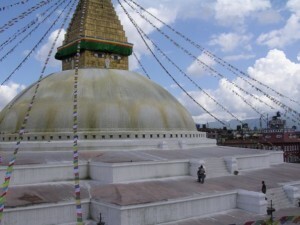 The Boudhanath Stupa is rich with history and is considered a wish-fulfilling stupa for all who offer hopes and prayers there. So far it’s working. A year later we got married in Colorado. Making marriage beautiful demands a whole lot of courage, compassion and desire to grow. More than needing to change the other person to fit into our version of who they are or should be, we learned to accept each other with full aspiration to grow to our highest calling. It definitely isn’t without fights, heartbreaks, tears, anger (so much anger in our case), resentments, disappointments, guilt, shame, and loads of laziness. But somehow we kept showing up, and we gained a renewed sense of inspiration from each of those fights. We learn, we do our best to communicate clearly and we love. There is no other option; everything else leads us to complacency and suffering. Every day brings new challenges, and we are learning to take it day by day, enjoying the taste of life, being excited about the unfolding discoveries about ourselves, and how it all relates to our ability to perform our duties with integrity in the world. We do our best to be honest with each other, to be accountable in an open and loving way while supporting each other to fulfill our own dreams. By being an honest, loving mirror for each other, we learn from our reflection much more quickly. There is a continual sense of gratitude that another being could love you and be willing to play with you so fully, and to dance endlessly together. By committing totally to this process, we recognize the reward and the depth of such commitment. As we learn more about ourselves there is a dedication to expand our commitment and fulfill our duty to create a stronger, greener, more harmonious world for us and for future generations. We recognize the global shift happening through the works of many, many dedicated individuals and organizations, and we are inspired, motivated and excited to be messengers of this change.